Your hair is said to be your crowning glory and as such it must look impeccable, especially if you are wearing extensions. Below are some tips on how to ensure that your extensions look great and well-kept. It is said that your natural hair should not be over-brushed. However, hair extensions need to be regularly brushed to prevent them from tangling and looking unkempt. You can make use of a soft bristle brush or a Pro Looper brush to make your locks look fresh and luscious. 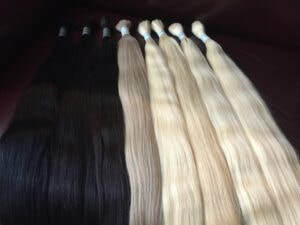 When it comes to the best technique to brush your extensions, I would say that things are much simpler than you think. Start at the bottom, as you would with your natural hair, combing out any tangles and straightening it before moving upwards to the top of your scalp. Extra care must be taken when brushing your hair extensions so as to avoid breakage and messing up your hair. Use medium heat ceramic irons. Your hair extensions won’t get dirty as often as your natural hair does, although that doesn’t mean shouldn’t give them a nice wash every once in a while. In fact, one of the best way to maintain your hair extensions is to keep them well washed and combed, with a couple of rules attached to this, of course. Begin by combing as above to detangle the extensions. Next, use a good of conditioner to keep your extensions soft and tangle free. The most important rule is to be gentle with the extensions while washing. In case any tangles re-surface, you can follow the wash and rinse by combing gently with a wide-toothed comb. A quality, nourishing leave-in conditioner will be great to follow the wash to ensure the hair extensions remain healthy and well-kept. Spray it on and work it in using the same downward motion, brushing out any remaining tangles carefully and voila – your hair is beautiful, clean and ready to dry. 4. Allow Your Hair Extensions to Dry before you go to Sleep. Yes, I know how tiresome and boring it is to wait for your hair or hair extensions to dry naturally but hear us out. While hair straightening and drying equipment speeds up the process and helps to style your locks, giving your hair a break from excessive heat is actually a trick towards having healthy hair. Some great advice is to wash your hair early enough in the evening and give your hair time to dry naturally which will save some time in the morning as you won’t have to deal with tangles and odd knots resulting from sleeping with damp or wet hair. Its recommended to wrap up your hair into ponytail or braid. 5. Blow dry your Extensions Carefully. Use a low-heat setting to dry the micro rings and surrounding hair first then proceed to style/dry the rest of your hair as usual. See? It’s quite simple! You still get to use your blow dryer with the only difference being the fact that you’re not applying excessive heat hair thereby reducing shedding and breakage. Hair extension care at the end of the day is just like normal hair care but this one needs more attention because once it is ruined, it does not grow back like natural hair would. So care for your hair so you can step out in style. Wear a cap when swimming or try to keep most of your hair dry keeping it wrapped up in high ponytail. Chlorine and salt water can lead to tangles and mat ups. It is recommended to keep your hair up or in ponytail when exercise or swim. Use a good quality shampoo and conditioner as well as leave in conditioner to keep your hair soft and easy to brush. Avoid putting conditioner directly onto micro bonds to prevent slipping. PLEASE NOTE: If you loose a few strands DO NOT PANIC, it’s normal to loose a few strand during wear and tear. You can always contact me for maintenances or touch ups.